Beet Latkes with Horseradish Crème Fraîche --- crispy ruby red beet fritters are a colorful and delicious twist on the classic potato latke. Peel the beets and shred them. You can use a box grater, or a food processor. Pat them dry with paper towels. Beat the eggs in a bowl, and add the beets, flour, salt, pepper and the herbs. Toss everything to combine well. Heat about 1/4 inch of oil in a frying pan over medium heat. 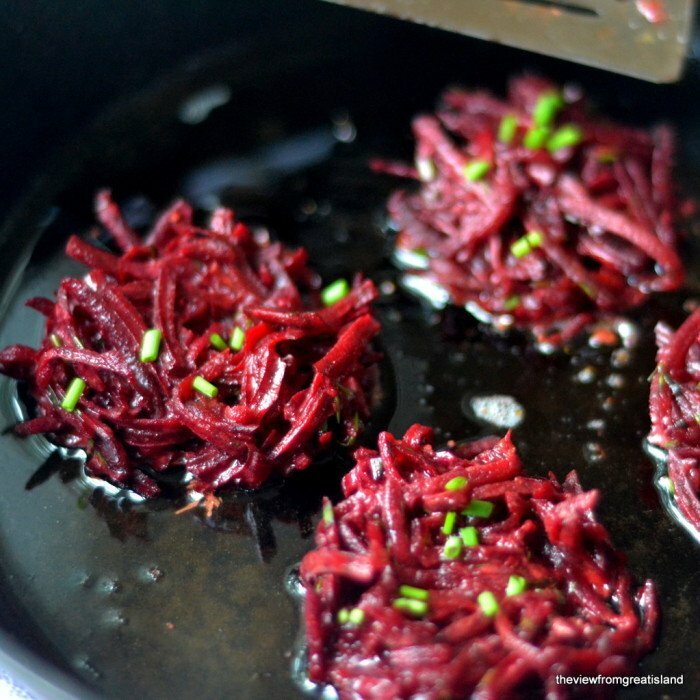 When the oil is hot, drop heaping tablespoonfuls of the beets into the pan, flattening them out into little patties. Fry until golden on each side, about 2 minutes per side. Drain on paper towels. Stir together the horseradish and the crème fraîche to make the sauce. Serve the latkes hot with the sauce on the side.